Nate Miller's Tabletop Games: The Port Doxie project. A YT-1300 for our Star Wars campaign. The Port Doxie project. A YT-1300 for our Star Wars campaign. While I'm taking a break from running our Savage Hyboria game one of the other members of our role playing group has started a Star Wars Edge of the Empire game. The group has a YT-1300 transport we have named "The Port Doxie". 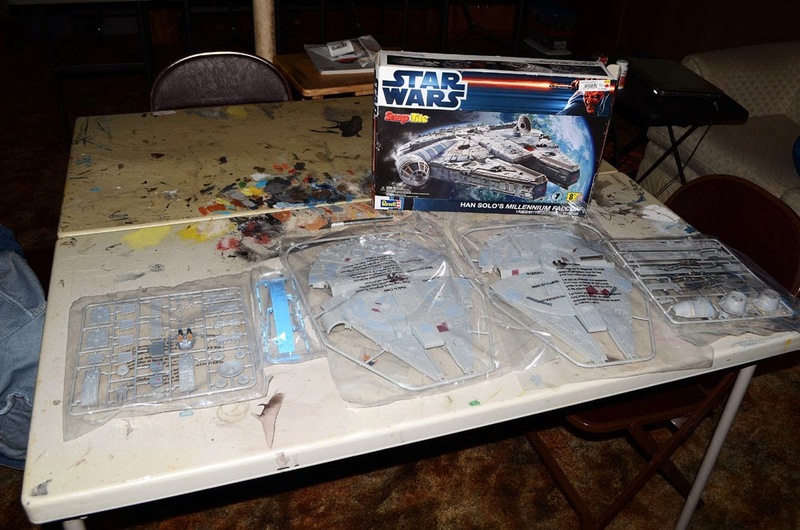 I picked up this Revell Snap Tite Millennium Falcon kit to represent our ship. This kit is actually very under scale for the 28mm miniatures we will be using for the campaign but I knew that when I picked it up. Although the box doesn't list the scale most modeling sites list it at about 1/72 scale and I would say that is pretty close. It is a pretty chunky kit and it looks a bit on the thick side but this is for a game piece and not for a scale modeling project. I would have rather had the AMT cut away kit but they are no longer in production and are getting harder and more expensive to come by. The advantages of this kit is that it is not only in production but also very easy to put together. I've put together my fair share of models but it is not my favorite part of miniature war gaming so that is a bonus for me. As far as the scale thing goes that is also a trade off. Yes it does look a bit small but if you check out this post in the Lead Adventure Forum you can see a finished version of this kit used with the WoTC 28mm Star Wars minis and it looks pretty good. Also a true to scale model would be twice that size and take up a large section of the play table. That's a pretty reasonable reason to scale back on larger ships especially since this is for a role playing game and the scene may change several times in a session. Another thing to consider is that when they filmed The Empire Strikes Back was built substantially less than full scale to save money. I've heard it was perhaps even 50% smaller than it would have actually been, so in some ways this model is more true to scale to the only actual full set build. Ultimately it is what I could find in a price range I could manage and it should work as a game piece. With any luck I will have it built and painted by next Sunday which is our next session. Of course it will be a custom paint job because it isn't the "Falcon".